Thanksgiving is by far my favorite Holiday. You don’t have any pressure to find the “perfect” gift or make sure that you’ve wrapped, decorated, cooked, cleaned, etc. Instead, you get to focus on friends and family. It is a wonderful time for fellowship and reflecting upon the endless list of things that we have to be thankful for. One of the things we so easily take for granted is FOOD. Food is sustenance, food is nourishment, food is medicine, and food provides an excellent to gather with people you love! 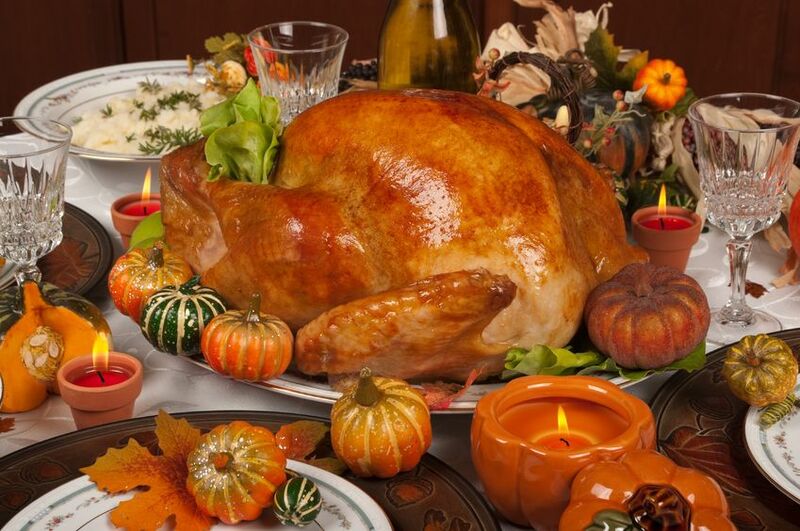 Are you hungry yet for that Thanksgiving meal? I know I am! I seriously can’t wait. If you didn’t notice from my substitutions above, I have MANY food intolerances. I have Celiac Disease which means that I have to avoid all gluten (the protein found in wheat, barley, and rye). On top of that, I have severe intolerance to eggs, dairy, soy, nuts, most fruit, coffee and some nightshades (tomatoes and potatoes). Yikes! Nevertheless, I have found so many wonderful options and I don’t feel like I’m missing out. Even on Thanksgiving I make versions of my favorites to make sure that I can enjoy the meal with everyone else! To avoid over-eating and making this holiday too glutinous, I have some tips that I use and hopefully you can to. To begin, I start my day with a good workout. I love to run and I’m an early riser so I’ll likely be up by 5:30 and have a nice run. This gives me energy and gets my metabolism humming. This will also help to offset some of the calories I consume later in the day. I’m usually not very hungry when I first wake up but if I am, I’ll grab a few slices of turkey for some quick protein. Other good options would be a hardboiled egg, yogurt, or piece of whole grain toast with a tablespoon of nut butter. After my workout, I’ll make sure to have a quality balanced breakfast. This is KEY. Many try to “save up” calories for the main meal but this will only service to sabotage you for many reasons. You’ll be tired and cranky and won’t enjoy the fellowship with friends and family. You’ll be so ravenous that you’ll over-eat at dinner and regret it. You’re more inclined to mindlessly snack on hors d’oeurves , which easily become the calorie equivalent of several meals. Your breakfast should be high in protein. According to experts at the University of Missouri , a breakfast rich in protein significantly improves appetite control and reduces unhealthy snacking on high-fat or high-sugar foods in the evening. This will set the pace for the rest of the day. It’s also important to have a healthy fat source and complex carb (whole grain, fruit or veggie) to make it a complete meal and keep you satisfied. My breakfast will be a brown rice English muffin, 4oz of nitrite free all natural turkey breast, ½ avocado and mustard (I’m a mustard freak). After my run, I need some complex carbs to replenish my energy stores as well and protein and fat to help with muscle recovery. Omelet made with 2 whole eggs, 2 cups of veggies (spinach, mushrooms, peppers, asparagus, etc) have with 1 slice of Whole Grain toast and top with 1/4th sliced avocado or 2 tbsp cheese. 1 cup cooked oatmeal mixed with ½ cup blueberries. Top with 2 tbsp nuts, 1 tbsp ground flaxseed, cinnamon, and 2 tsp brown sugar, honey or stevia. Have with 1 hardboiled egg, 2-3oz of turkey or mix in ½ scoop vanilla protein powder! I will have to go into work for a little bit but by noon I’ll be done and heading home to cook! Our main Thanksgiving meal will be at 4pm. At noon I plan to have a balanced meal to keep my blood sugar stable and to keep me from over eating the wrong things later. I want to enjoy my dinner meal…not be so light headed from poor nutrition that I can’t enjoy it! This meal for me will be 4oz of turkey meatballs made with 93% lean organic ground turkey from Costco. I top this with ½ avocado, salsa (I love salsa) and have with 2-3 cups of veggies (my favorites are broccolini, Brussels sprouts, red cabbage, yellow squash, lightly steamed with crushed garlic and a little sea salt). I AM human so I probably will have a few bites of cookie dough and I just might lick the spoon when making the flourless chocolate cake but I’m doing it for the good of my guests! They can’t eat something that doesn’t take good…am I right? Keep carbohydrate portions in check! Thanksgiving can be VERY carb-heavy, which can leave you sluggish and aren’t as friendly on your waistline. Excessive intake of carbohydrates on a regular basis can have negative impacts on health. A study conducted by the Division of Preventive and Behavioral Medicine, University of Massachusetts Medical School, Worcester, Massachusetts, suggests that higher total carbohydrate intake, related to lower high-density lipoprotein cholesterol (HDL-C) and higher serum triglyceride levels. Results suggest that there is a unfavorable effect of increased intake of highly processed carbohydrate on lipid profile, which may have implications for metabolic syndrome, diabetes, and coronary heart disease. Chose complex carbs as opposed to simple when possible (sweet potatoes, whole grain rolls, etc ). Tread lightly with sides. This can be difficult, as there are SO MANY good options! Keep portions to 1/4th cup serving or less. This way, you have a taste and enjoy it! If there are certain items that you really love….DON’T eat the things you could care less about. Make your meal count! Eat a small amount of dessert and savor it. As you saw above, I’m making a flourless chocolate cake AND chocolate chip cookies. Again, I’m human and I like my sweets so I will eat both but I’ll keep my portions small. Now a few recipes for some of the dishes that will grace my Thanksgiving table. Meanwhile, peel the skins off both the celery root and the parsnips with a vegetable peeler or large knife. Chop each vegetable into 1 inch sized pieces. Transport to serving platter and dish up hot. Melt the oils and chocolate chips in the microwave or on the stove top. Meanwhile beat together the eggs and sugar for about five minutes at high speed until pale and more than doubled in volume. Add the coffee and vanilla to the eggs and beat until combined. Sift in the cocoa and salt and mix again until combined. Stream in the melted chocolate and oil and beat until combined. Divide into prepared cake pans and bake for about 15-25 minutes or until toothpick comes out with some crumbs attached but no longer wet. For the ganache, melt together the chocolate and 3/4 cup of coconut milk in the microwave. You’ll want to turn the microwave power down to about 30% and stir often or use a double broiler. You can use the ganache just like this, or you can whip it up a bit for some added volume. Place the bowl of melted chocolate in a larger bowl of ice water and whip until it fluffs up a bit. Peel and chop the sweet potatoes into large chunks. Place the chunks in a large saucepan and cover with cold water, bring to a boil and reduce to simmer. Simmer until the sweet potatoes are fork tender, about 15-20 minutes. Once done, drain well and let cool. Meanwhile, preheat your oven to 350° and spray a little cooking spray on a 9×13 or 9×9 inch casserole dish. In a mixing bowl, combine the pecans, oats, oat flour, and brown sugar. Cut in coconut oil with a fork or knife until the mixture is sandy with pea-sized chunks of oil. Set aside. Place sweet potatoes into a stand mixer and mix using the flat beater until creamy. Add the coconut milk, maple syrup, oil, vanilla, cinnamon, nutmeg, and salt to the mixer. You can also use a blender or food processor, blending the sweet potatoes in batches. Pour the sweet potatoes into the prepared dish and sprinkle on the brown sugar and pecan mixture. Bake uncovered for 40-45 minutes, until the top is golden brown and the sweet potatoes are bubbling.